Hey look, they’re alive! Plain White T’s are finally out of Chicago with more empowered love anthems than Delilah can handle. After being nearly off the radar for a couple years with Wonders of the Younger and contributing the Frankenweenie soundtrack, the quintet are showing that they really haven’t lost a step with this EP. 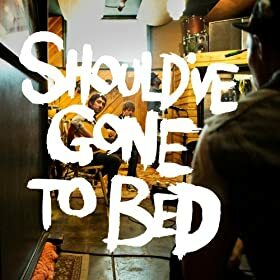 Should've Gone To Bed opens with the title-track, which pretty much sets the tone for the rest of the EP: an alcohol fueled chant dealing with the complex emotions of getting over someone. In other words, those awkward phones call to your ex after one too many shots. The fun acoustic intro with the hard drum gives the song a more heartthrob feel to it and perfectly fits Tom Higgenson’s lyrics as he scrambles to explain/figure out what on earth he was talking about. The song is the Plain ‘Giving Tree’ White T’s we all know and love. The song if a simple acoustic love melody with the sweetest lyrics you may have ever heard. “I’ve got scars from a pocket knife where you carved your heart in to me,” are just a sample of the heart-felt words that make up the song. Whether you like new, old, or any kind of White T’s you’ll find that they still got that sweetness factor that they’ve always had. ‘Helium’ kind of blends the first two songs together. It’s too hard to be a simple ballad, yet too soft to have the same chant feel from ‘Gone to Bed.’ But the song manages to take the best parts of the songs’ main ideas and still keep the whole mood of the EP going with full force. Not only is Higgenson running on empty in this relationship, he’s realizing his accomplishments and being at peace with the life he’ll soon (hopefully not too soon) leave behind. The EP closes with ‘Haven’t Told Her.’ By now the listener has realized that the songs really aren’t going to change a lot. Given while the songs sort of mush together around the end if you’re a sucker for a kick drum, this song will only carry this EP higher on your playlist. It may also be filled with cliché’s about beauty, but cliché’s from the Plain White T’s are some of the most genuine cliché’s you’ll probably ever hear. While Should've Gone To Bed really doesn’t take any chances as far as structure or topics, it’s clear that the Plain White T’s really haven’t lost any game. They prove that their fashion of love song-making works for them and if we can expect anything like this on an album, it can be assured that there will be little to no disappointment. Should've Gone to Bed is out now via Hollywood Records.